Join Us For Our Friends and Family Event! Annually we host an exclusive shopping experience for our clients and their friends. The savings are all the Black Friday deals with additional sale items being marked down. This year we have teamed up with Orangetheory Fitness, Precision Hyundai and Cottage Club to Win some BIG prizes. We also have our colouring contest for the event and win some cool prizes, see below. Entertainment will be by Robyn Hauck who will be singing all your favorite Christmas songs! This year we have some pretty cool things going on with our Partners HBC, Orange Theory Fitness, Precision Hyundai and Cottage Club. So RSVP and Bring Your Friends, no limit! No line ups just savings! Black Friday deals and more! Cottage Club – Ghost Lake – Free draw to enter and win a $300 Hudson Bay gift card. 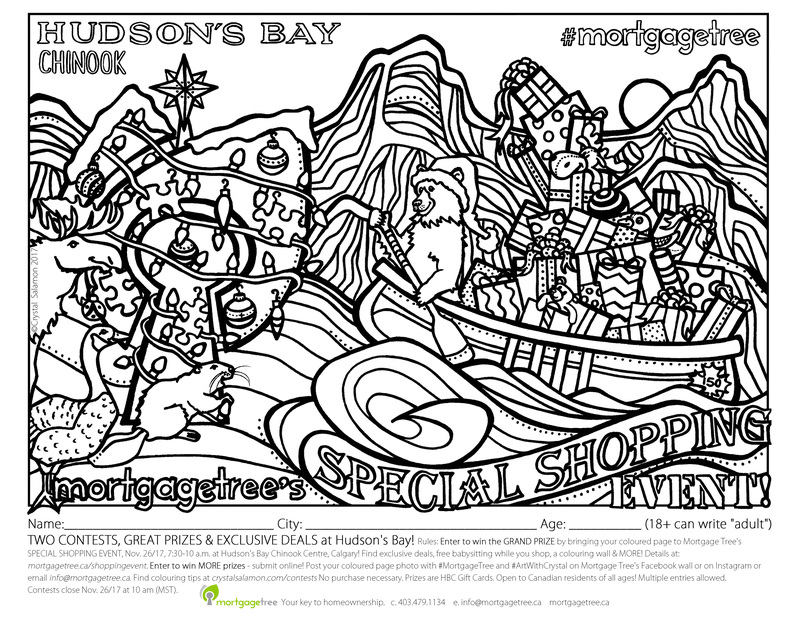 Hudson Bay Shopping Event Colouring Contest!